Narrator’s Voice – When I start to listen to a book, if I feel that the voice of the narrator engages me and draws me into the book then it is definitely a winner. If the voice doesn’t then I tend to stop the book almost instantly. Sustainability – Does the story keep me engaged and wanting to listen. If the storyline means that I don’t really want to listen to the book then it gets removed from my ipod. If, however, I want to continue to listen even when I should be doing something else, then this is positive. Content – Good books rely on a good story and lots of imagery. However, I don’t think you need to provide explicit gruesome content to make a storyline good. If there is excessive use of gruesome content or long boring descriptions of a hat that someone is wearing, then the book again goes on the ‘avoid this book’ list. The Martian a book about an astronaut, Mark Watney who gets left behind, presumed dead, after a expedition to Mars has to suddenly leave. The story follows his exploits as he tries to survive the harsh environment of the red planet, dealing with virtually no atmosphere, no food or water and no form of communication or real hope for a rescue. The book details his thought processes and the actual science as he solves, survives and copes with a variety of problems and situations which are thrown at him by the planet with one focused aim – to survive until he is rescued. Narrator’s Voice – The narrator kept me engaged with the story and used the range of voices well in order to ensure I knew who was talking. His voice was easy to listen to and he communicates emotions and relationships between the characters well. The book actually did make me laugh out loud as I listened to it and this is all credit to the author Andy Weir. His understanding of the characters and their humour is fantastic and he relates everything to real life situations very well. Sustainability – I have to confess I had a break from this book, about a third of the way through. I’m not sure why this was, especially when I got to the end, since I really enjoyed the whole book. Maybe it was just that initial ‘getting into the book’ moment. The book does have that element of two separate situations developing, the one on Mars and the one back on Earth. I really like this approach and especially enjoyed the Earth side of things. Lewis the commander of the expedition and Annie the woman in charge of the media are two well presented and interesting characters. I would say, if you are not very scientific, then make sure you give the book a chance, there are long calculations and science theory in places, but consider it an education and a learning curve rather than a boring part of the storyline. Content – This book doesn’t rely on imagery to make it real. The focus is on the science and, having some what of a geeky science background, I enjoyed listening to the scientific descriptions, rather than the author just saying – ‘Mark did this because it was the best thing to do’. I even did find myself, at times, trying to figure out the problems which Mark faced although with my solutions I probably would have only survived an hour rather than years like Watney. The only real solution I came close to getting was burning hair to create the smoke in the blown off airlock. 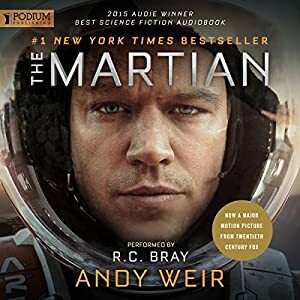 Andy Weir, the author, has a good understanding of people and situations, and you get to know the characters so well and actually start to create a bond with, not only the main people, but also the lesser characters. The guy who comes up with the maneuver is brilliant – I probably see some of me in him! I sometimes ‘blank over’ long descriptive sections in books, but with this one, I did find it very interesting. I do wonder how this will or has been translated into the film. Recommend this book? This book is essentially a rescue mission, but it doesn’t seem to relate to any format of a story that I have read/listened to before. Although you don’t need a science degree to enjoy the book, there is a lot of science in the story, but this doesn’t detract from the book, in my opinion it actually adds to it. The book has its tense moments and some very funny one liners, so I would recommend it as a really good read. Best book I’ve read? Nope, that still remains with The Tower Towers, but it would be somewhere in the top twenty. You can keep up to date with my content by following me on Twitch, Twitter and Facebook. Of course any subscribers to my YouTube channel is always appreciated.